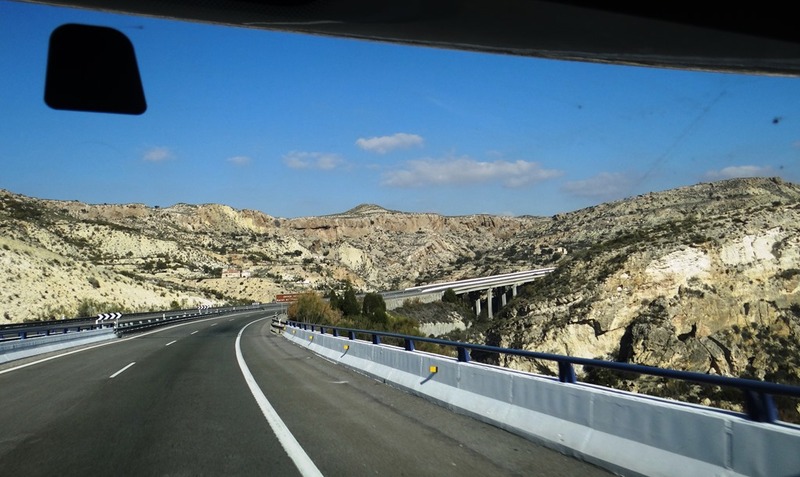 We left the Playa Granada Gratuito Parking lot at 08:30 for the short drive down to Motril to find the Fiat dealers – simple to find the place (thanks to the route info from Phil & Pauline) – but the dealership was closed. I made enquiries at the Peugeot dealership next door (which was open); my fear being that today may be a tag-on holiday to yesterday’s ‘Three Kings’ National Holiday and they informed me that the Fiat dealership does not open until 09:00 – Okeedokey. At 08:58 a chap rode up to the dealership gate – on a Suzuki V-Strom 650 – overcame security (he had a key for the lock) and opened the showroom entrance doors. I followed him in and we mutually discovered that his knowledge of English matched my knowledge of Spanish. He indicated for me to wait 5 minutes – could have been 5 hours, 5 weeks, 5 months or 5 years for all I knew, but I took the gamble and spent the time admiring the many new cars in the showroom. 5 minutes later, with his PC booted up, we started conversing through Google Translate and short-cut a process that would have taken a Neanderthal Luddite the rest of the day to communicate. I was able to communicate our problem and give him Twernt’s year and model information, etc. The next employee to arrive must have been a mechanic, Twernt’s status was relayed to him by Mr. V-Strom – Mr, Five-Foot-and-a-Peppermint-Mechanic collected some techie equipment (a torch) and followed me out to Twernt. 5 minutes later the Spanish equivalent of ‘Kaput’ was announced and ‘Peppermint’ spoke what was probably the only word of English that he knows – ‘Document’ (he must be a former Traffic Cop – unless there’s a height requirement for traffic cops) – and then, with Twernt’s V5 in his mitts, we both returned to the showroom/office (to make these dealerships financially viable they are multi-franchise – in this case they are Fiat, Alfa Romeo, Lancia and Jeep new car dealers). The entire dealership only had about 4 or 5 employees – plus a cleaner – there was a very nice, very new, Jeep Renegade in the showroom – wouldn’t mind that on a trailer! Mr. V-Strom then made a couple of calls before returning to Google Translate on his PC screen. The gist of his input was ‘the part will be here in 2 days, it has to come from Madrid, you return on Friday at 4:00pm, the cost will be €290 and you must leave a deposit of €150 to permit order processing’. Well, thank you Portugal! – I muttered something to do with Ragmans & Trumpets under my breathe and returned to Twernt (parked outside the dealership) to retrieve my debit card, from my wallet – in Amanda’s handbag. At this point, the cost of this replacement part and the delay to get it would mean hanging out at Playa Granada Gratuito Parking for another 2 nights and our plans will now being leap-frogged by other priorities – hassles over water in, waste water out, sanitation, internet, etc. – plus I have to tell Amanda about this delay I prefer only having to report negative events to Tilley. “Amanda, quick – I need the debit card to make a payment” – not a time to invite ‘attitude’ admonishment. The ‘quick’ did it! – the debit card was thrust into my hand and the ‘urgency’ of the situation over-rode the desire to gain detailed knowledge, in the form of a blow-by-blow recount, of what had led to this audacious request for Amanda to be dispossessed of my debit card. The devious coward returned to the dealership showroom/office and was greeted by Mr. V-Strom who was pointing at his PC screen. Google Translate then informed me that the gibberish in the right-side translation panel of his PC in some way actually meant ‘Part will be here today, return at 4:00pm for fitting’ (in a proper language fit for human consumption and understanding – well, as far as this human is concerned anyroad). The sun was shining and my world was rapidly coming together to be as one with it. I don’t kiss geezers but Mr. V-Strom came pretty close to being the first. I made the payment, returned to Twernt and told Amanda that we needed to be back here at 4:00pm to have the diesel filter housing replaced. We decided to spend the next 5 hours or so at Playa Granada beach enjoying the sunshine that was now in bursting through the sky. Post mortem: Had my debit card, in my wallet, been in my pocket when Mr. V-Strom asked for the deposit, I would have made the payment, left the dealership and returned 2 days later to get the part fitted. We had a great day doing no more than people watching on the promenade and walking the dogs on the beach (Tilley is in love with the sea and makes a dash for it once released from her lead, she then stands in the ‘paddly-bit’ staring back at us!). We had lunch in Twernt and the time flew by before we returned to the dealership, we had the part fitted in 20 minutes, paid the balance and then returned to the ‘wilding’ park at Playa Granada for our final night in the Motril area. At last! Everything is together and we’re ready for moving on, we have 5 or 6 stopovers planned (with coordinates) until we reach the San Javier area; no rush and we’ll settle for a few days wherever the camping and location come together to meet our expectations – if none do then we will have made a mistake by choosing to travel up this coastline and we could end up in Ol’ Blighty whilst the snow is still around. Of course, we might find great camping with easy-to-reach ‘naff’ locations or vice-versa – another reason why we need adequate secondary transport – it would increase our options – great camping and good locations for day visits that are within 10-20 miles or so – with adequate secondary transport we would be ‘sorted’. Poor camping but great location then we can push on to better camping and return more easily to explore great locations that we can travel to using adequate secondary transport. Today we’re heading for Almeria and an Aire listed in ‘All The Aires – Spain & Portugal 2014’. The Satnav took us to the garage forecourt that fronts the Aire. The guy in the garage informed me that the Aire had been closed down in January 2013 – Bugger! – how come the ATA book states that they inspected it in 2013? 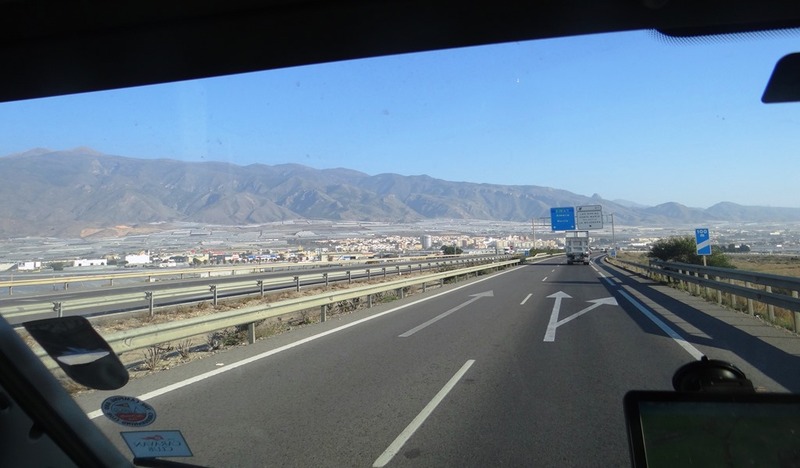 There was another option listed in the Camperstops book, I’d been put off of that by a comment that large vehicles may find it difficult to leave by the exit route and should perhaps leave early in the morning using the ‘entrance’ route into the Aire – after the Camping Playa Granada saga we didn’t want to take the risk. and ‘Oasis al Mar’ – a model Aire in the making – looking good! This recently developed Aire is situated twixt Vera and Vera Playa. We learnt that Wolfgang, the owner, is a German chap who, along with his wife, had been MoHo full-timers for two and a half years after ‘selling up’ in Germany. They have now ‘settled’ here at Vera/Costa developing ‘Oasis al Mar’ opposite their villa – Wolfgang and his wife open the Aire from 1st October to 31st May and they then return to their MoHo travels for 4 months. Their Esterel MoHo is parked by the Aire entrance and Wolfgang uses it as his office each day – he spends time relaxing outside his MoHo just like every other MoHo traveller at this camping – he could be in his villa but I suspect that his love of the lifestyle brings him to operate ‘Oasis al Mar’ this way. Another couple, who I think may be related to him, also have their MoHo by the entrance, they greet newcomers and undertake Aire management duties. There is a small office building and Wolfgangs wife visits each day from 5:00pm to 6:00pm when all visitors have to call in to pay their fee dues. You can see who controls the ‘do-re-mi’ here then – is this a MoHo thing? A very well laid out site, with some very large MoHo’s present – mostly German – further development appears to be taking place but it accommodates 50 MoHo’s in its current state. It has all the facilities that you need – unless you need a shower/toilet block and a shop, in which case it doesn’t have what you need. There are 4 tiered terraces with ample room to manoeuvre, not all pitches have EHU but there are signs that this is work-in-progress. There is a supermarket in a nearby urbanisation (about 1 mile away) and the beach is a similar distance away. ‘Oasis al Mar’ also has a laundry room (€3) and a clothes drying area plus a drive-over waste water dump alongside the chemical toilet disposal point – except you can’t dispose of the contents of Thetfords, etc. that have had chemicals added (other than AquaKem Green). There is also a Pétanque-Boules court and ‘Whiffy’ is provided free from two routers with antennae located on the top and third-from-top tiers of the parking terraces. A neat and tidy site with good company and we’d be happy to stay here for a while – cost is €8/night plus €3/night if you’re lucky enough to get a pitch where EHU exists ……. and yes, you’ve guessed it – we weren’t lucky enough to get a pitch where EHU is provided – but we did put our name on the list to get EHU at the earliest availability. We booked and paid for 5 nights – enough time to get our internet stuff sorted out and to get some shopping in plus filling up with water, etc. to ‘prep’ Twernt for a few days of ‘wilding’ again – the next 2 stops that we have planned are both ‘wilding’ locations. The internet is slow but, patience being a virtue, we will endeavour to struggle on – hanging on in quiet desperation is the English way (Floyd). Before I am out of my dressing gown, Wolfgang’s-suspected-relative informs us that we can move ‘right now’ to an EHU pitch. And, from this pitch, the ‘Whiffy’ is the fastest that we have experienced since leaving England! So I ‘blog away’ to get matters up to date – ‘pages’ update first (Live Location, Sites and ‘Costings’). An ‘idle’ day is therefore spent blogging and carrying out sundry Twernt duties (empty the ‘fridge as I ‘blog away’). I succeeded in publishing the Map and ‘costings’ updates and then I was able to start work on one of the two blogs that are needed to bring our ‘activities’ postings up to date – getting there! We also had heard that Beth, Nathaniel, Alfie and Tom will be heading for this Aire tomorrow – Great news! 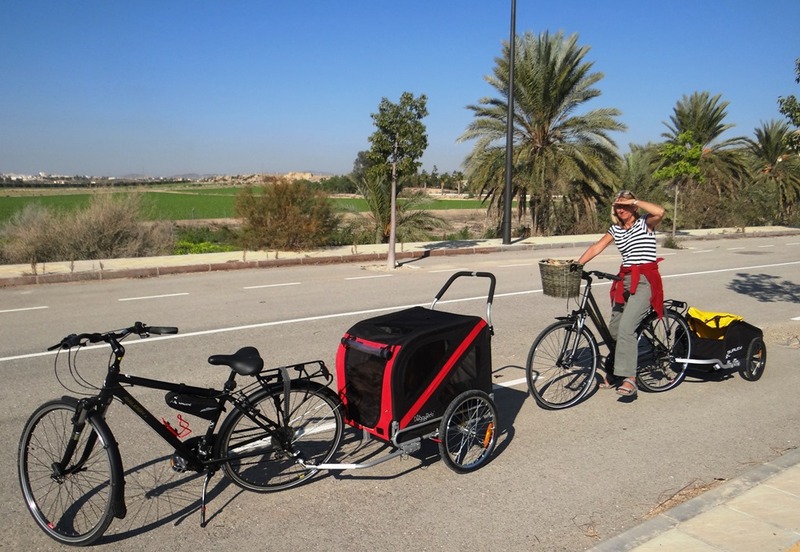 – we follow their blog – A Major Break – their van was robbed on Three Kings Day in Alicante and a LOT of stuff was stolen. They are understandably disillusioned, so we hope there may be some way that we can help them. With one out of two blogs completed, I published and then started work inputting stuff for the second blog (this one! ), until my hearing receptor doofah thingies had ‘incoming’ …. “Let’s get the bikes out, fix the trailers on and ride over to the supermarket”. Our ‘secondary’ transport set-up that is destined to be relegated to being our ‘back-up’ to our ‘secondary’ transport. The road leading to the supermarket is closed-off to traffic, this looks like a newly built route that has been abandoned due to the economic downturn that has gripped Spain – everyone in England should dump their UK properties and move down here – that should improve the infrastructure in this preferred and deserving country! 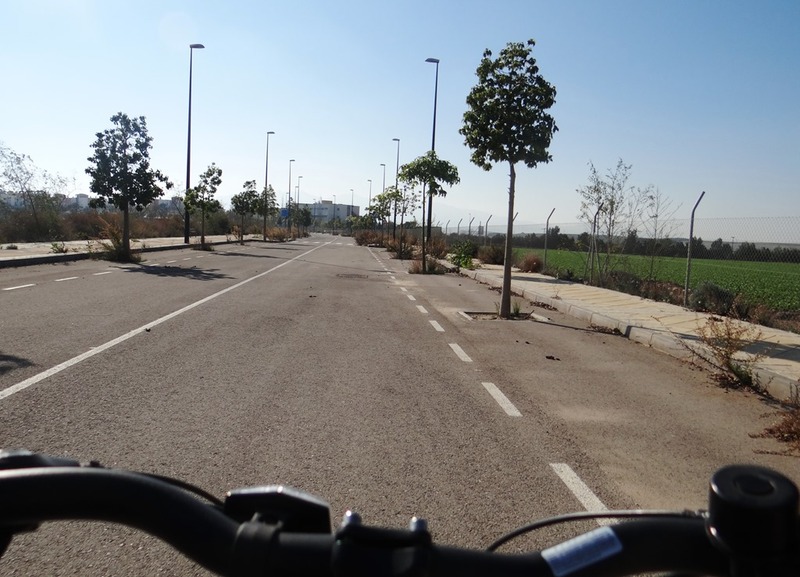 There is an excellent cycle path but why bother when you ‘own’ the entire road! In the evening, I abandoned the updating of ‘blog two’ and we took advantage of the fast internet speed and watched multiple soaps and other programmes from YouTube. We also welcomed Beth, Nathaniel, Alfie and Tom to this ‘Oasis’ Aire – we just hope that a couple of oldies and their dogs can give them a reason or two to put their chins up and not let the thieving gits in Ailcante stop their dream from happening. Nathaniel is originally a ‘Blidarth’ lad (Blidworth, Mansfield) and did his own conversion of their van. Top man. Look at the dogs’ faces! Can’t wait to see them in March – will Shakey remember me? I’m sure he will, we say ‘Where’s Holly’ to him frequently and he darts around looking for you…………. whoever you are? Thanks Eric – that gave me an idea – just downloaded from https://play.google.com/store/apps/details?id=com.smartmobilesoftware.voicetranslatorfree&hl=en – a voice translator app! This is an Android one, must exist for apple? Free download although a pay version exists it indicates that you have 15 credits a day for the freebie version. I can do a lot of damage with this app! ps – it didn’t translate “Well, I’ll goo to ar ‘ouse” very well – even the english came up as ‘well go to her off’ – now I need an elocution app! Lol – speaking of nudes you could put ‘Vera Playa’ on your trip list – beach sellers with a difference! Roy, been following Your tales of the unexpected since I found them somewhere. Love the life you’re living and keen to do it ourselves. We’re taking our first step next month, 26th, for seven weeks. Cherbourg, Biarritz, Asturias, Portugal, might be having second thoughts on that bit because of the “roads”. Seville and then whatever. So many questions, the one that prompted this is, do you have much room in your garage when the bikes et al are in there? I’m finding it hard to make a list of what we NEED, to load as opposed to what I’d like. Safe travels. Hi Nick, FIRST step – welcome to the ‘club’ – it won’t all be smooth at the beginning but it’s 100% worth it once you get on top of it all! As to the garage – we keep the cycles on a tow bar mounted cycle rack and not in the garage – I did want to keep the bikes in the garage but there just wasn’t enough space. Having said that, I do think that we are carrying more than we need to (in the garage) for a trip like this. 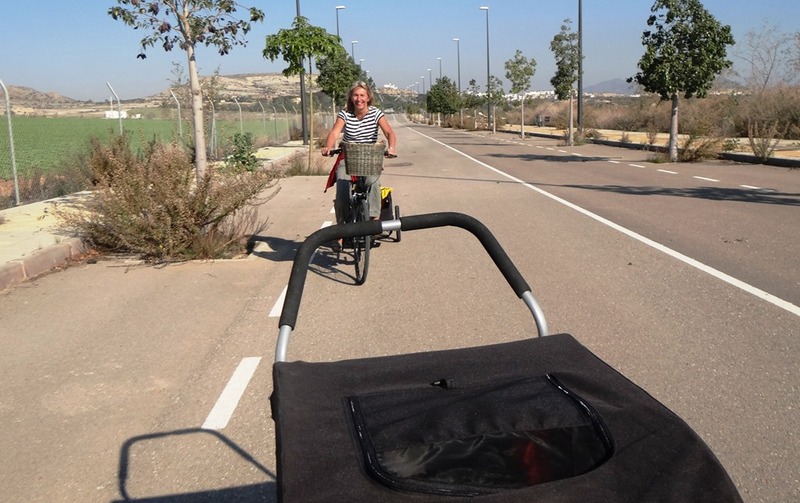 We would still want the ‘big things’ that are in the garage though – ladder/steps/platform – spin drier – Doggyride Trailer – may ditch the Burley Nomad but it has been useful (once!) – 2 large toolboxes (only need one and then not all of those tools) – Levelling Blocks (x2 sets) and outdoor seats. There’s a lot of other stuff in there that ‘may’ prove useful – what do you mean I don’t need a full paint re-spraying kit! Or my as yet unused steam cleaner! we had a BB translator app – I voice translated to a lady in a village in Portugal for toilet chemical, whatever it (BB) said to her she was not too happy, she looked at me like i was a bit strange. It’s never a good idea to tell a lady that she smells like a chemical toilet, Sandra! Twernt will be a bit like ‘Triggers broom’, all original but everything replaced, what next do you want to have new before you come home, Been great keeping an eye on your stops and few on our map for our trip. Hope the next few weeks will be uneventful, what are your plans in direction. We have no choice, if it needs fixing, it has to be done – I’ve done a couple of ‘Fred Karno’ fixes that will be need ‘proper’ jobs doing on them when we get back. About to release the ‘Vera Playa’ blog – worth a read, nice aire for your list if you’ll be that way – not sure about the beach though ………!!! We plan to stay here to get our business admin sorted and tax returns completed and then maybe hire a car to check out up and down the coast from our Cartagena aire. Hi Tom, Crikey that’s €50 less than we had to pay. I did read that some folk feel that we should be reimbursed because the metal version released as a replacement by Fiat is tantamount to them admitting that it’s their fault. I also read that a special Fiat tool is needed to access the filter. Then I’m wondering if they had that special Fiat tool at the garage that did our service. I couldn’t find a Fiat dealer that could take the 5 tonne Twernt so I had to use a ‘general’ garage. I put together a word doc and printed it off for them about how the chassis greasing needs to be done. Maybe the diesel filter tool needs adding to that sheet. Problem is, they said they did the greasing with all 6 wheels off the ground, but I have no way of knowing that was true and when you get a fail ‘down the line’ of course it wasn’t the garage’s fault!! Only way to know is either do it yourself or stand watch over the mechanic. 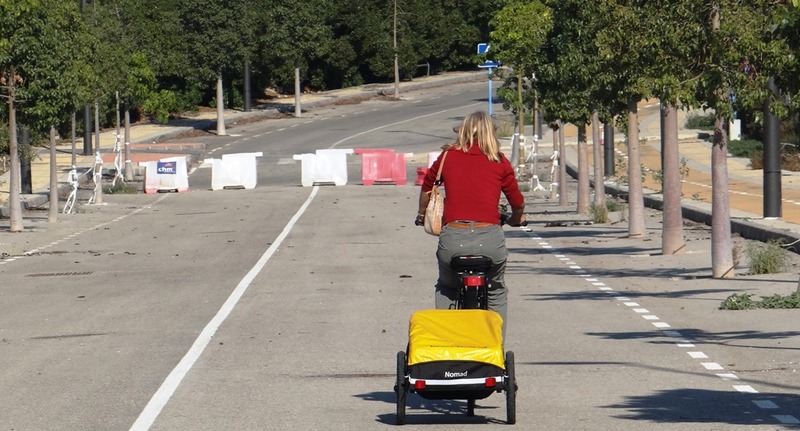 ps – it’s still the fault of Portuguese roads – as is everything that’s wrong in this world! Keeping up with your adventures, some really good stuff, especially from our planning point of view, looking to head off September for a year. Was thinking of heading down to Sicily this winter but TBH will probably head for spain and do Sicily next spring. I guess on the nudist beach with them all sunbathing ,there was no lack of places to park your bikes while you went for lunch 😃 . Haven’t bought a MH yet but pretty sure of layout required. How’s the AT bearing up?will probably aim for a shorter one 7.5m or thereabouts. Was looking at a Bailey but the AT Cheyenne also fits the bill. How has the Snooper been? Worth the cash? Hope you don’t mind the questions. Hi Chris, good to hear from you. We did talk about that choice of places to park our bikes! Some places there would have taken the 2 wheels on the doggy trailer! (that’s put a really horrible image in your head for the rest of the weekend!). The AT’s is going very well; problems can, and will, happen with any vehicle – not unduly worried about what we’ve had to sort out to date though. 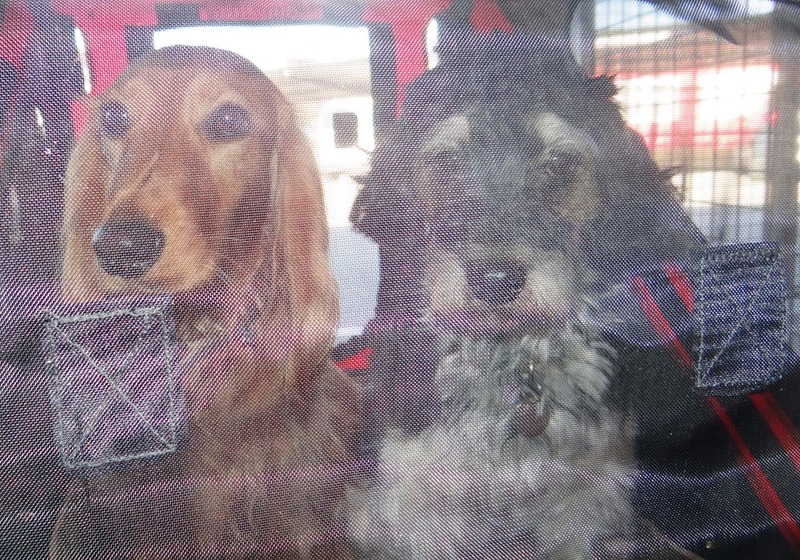 Layout wise, we would like a leather interior (due to the dogs) and I may get the skirts vinyled this summer – AT don’t produce as good a job on the ‘skirts’ as other manufacturers seem to – OK though, if maintained/polished regularly, which, I suspect, didn’t happen with Twernt – vinyl will be an upgrade though! My advise is to ‘dig’ into how the previous owner looked after the vehicle if you’re buying s/h – as we did. You can get a bit carried away when you find one that ‘seems to be right’. That’s when you need to take a deep breathe and get the checks done and be prepared to walk away. Otherwise you could find later on that many previously ‘hidden’ things need sorting out – inspect every nook and cranny! Also check the service history and go on the roof and make sure that it shines everywhere. There are some good ‘uns around that have been well cared for by fastidious owners. Shorter is definitely better ‘on the road’ and when parking up but big and long wins out when pitched up – which is where a MoHo spends most of it’s time. 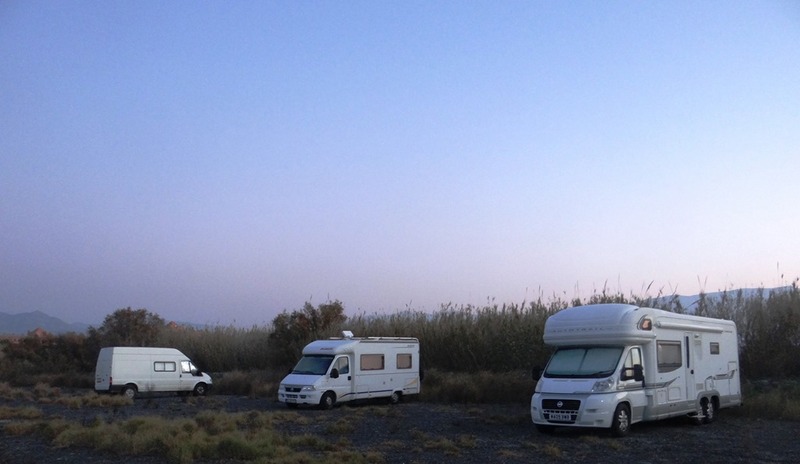 The latest Bailey’s do look good – they’re becoming a force to be reckoned with (as they are in the caravan world). I’ve heard a few saying that AT’s quality is on the decline whereas Swift quality is improving enough for them to possibly be the # 1 UK mass MoHo manufacturer now. Love the Snooper – it’s a good bit of kit, better for this job than the Garmin’s and Tom Tom’s that I had before – we also have CoPilot on the tablet but Snooper wins out everytime. Easy to set-up, easy to use and, when your last planned camping spot didn’t work out, it’s easier to find something on Snooper without messing about with maps, guides, site books, etc. Done that a few times and, when you’re p’d off from another ‘site fail’, Snooper saves you from getting even more stressed out. No problems on asking questions, Chris – but remember we’re pretty much newbies as well, so I’m just stating it as we find it! Glad to hear you’re moving again. Can’t believe I’m still voluntarily parked up – kids and why appears to be the question/reason. Wrong guess Maggs! I do have a ‘manbag’ but my wallet is so heavy that Amanda says that I shouldn’t be burdened with it at my age! Just a few more weeks now before we’re back in Blighty – we’re already planning how and when we’re coming back later this year – now in Peniscola that would probably be called Peniscolda if it was in England. 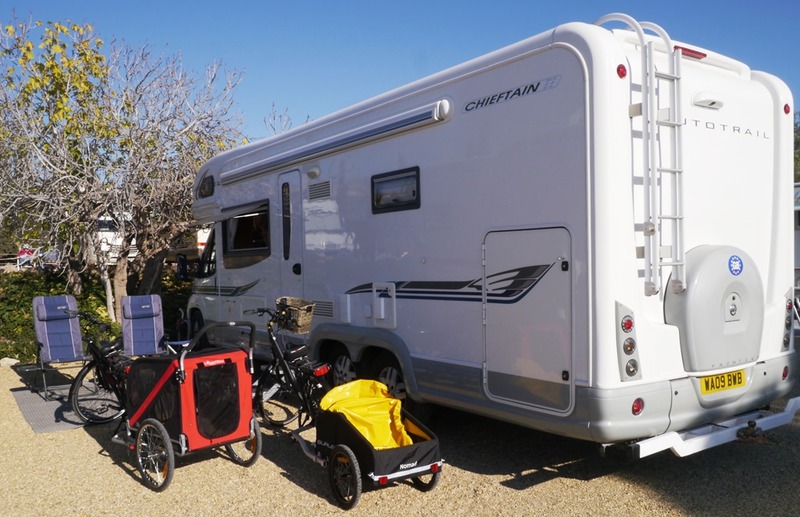 Hi loving the blog, and on the point of making a choice on whether you go down the car and caravan route have you thought of a demountable have a look at here http://www.amlrv.com/adventurer-truck-campers/ . I think they could be the perfect solution. Thanks Tracey, those demountables always seem to slip under the radar and they do have appeal – it’s just that we would want something that Amanda can drive as well – auto-only licence – I’m already under orders to include something that AJ can use and she won’t drive a LWB truck (VW Tiguan = Yes, Toureg = No!, Any truck = too big for AJ) – best not to ‘rock the boat!’. Better weather here today after the last 2/3 days of high winds; haven’t seen any of the snow being reported – nice and sunny today.